The essence of Ajax Push is the ability to trigger updates to the client from events or changes that occur on the server. This makes Ajax Push highly suitable for collaborative applications where one user does something that changes the current state of the application and other users are interested in seeing that change. There are many different ways to take advantage of Ajax Push to add collaborative features to your rich web application. From the developer's perspective, Ajax Push is exposed through the SessionRenderer API. This tutorial is designed to provide a simple and clear illustration of how to get started with the SessionRenderer API to add Ajax Push to your application. The application consists of two counters. One is an application-scoped counter that can be adjusted and seen by all users. The second counter is session-scoped so changes to the value of this counter are restricted to the individual user. The goal is use the SessionRenderer API so that any modifications to the application-scoped counter result in Ajax Push updates being sent to all application users. You can develop ICEfaces applications using the tools of your choice. 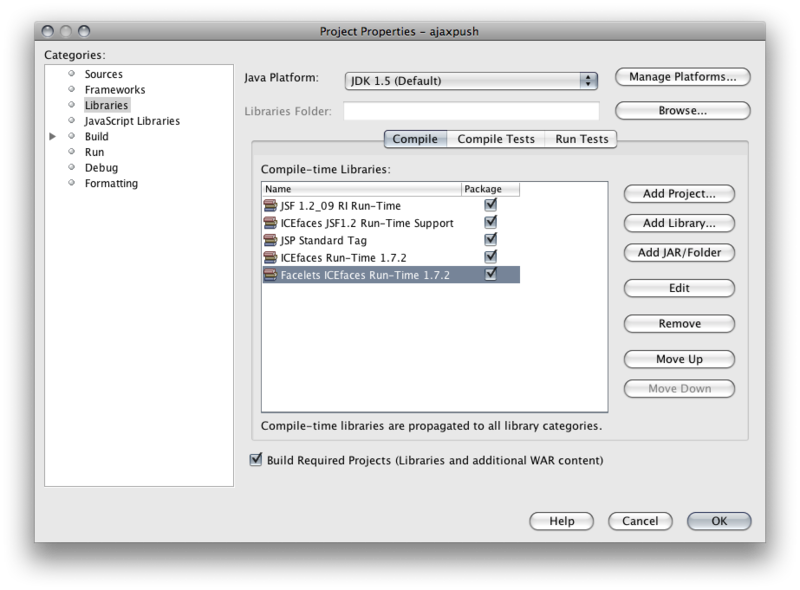 To make life a bit easier, ICEsoft also provides project integration plugins for a number of popular IDEs. 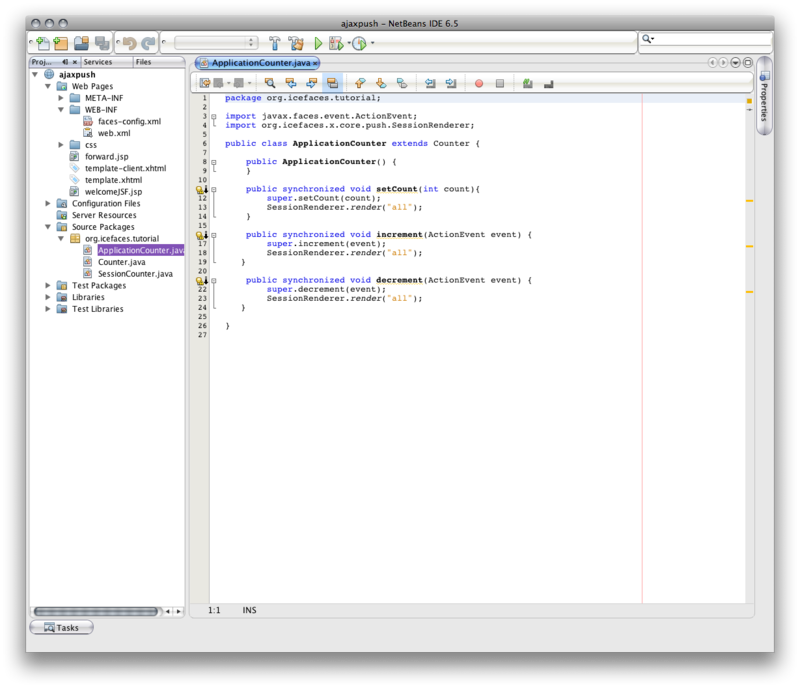 For this tutorial, we'll be demonstrating how to build the application using NetBeans 6.5. 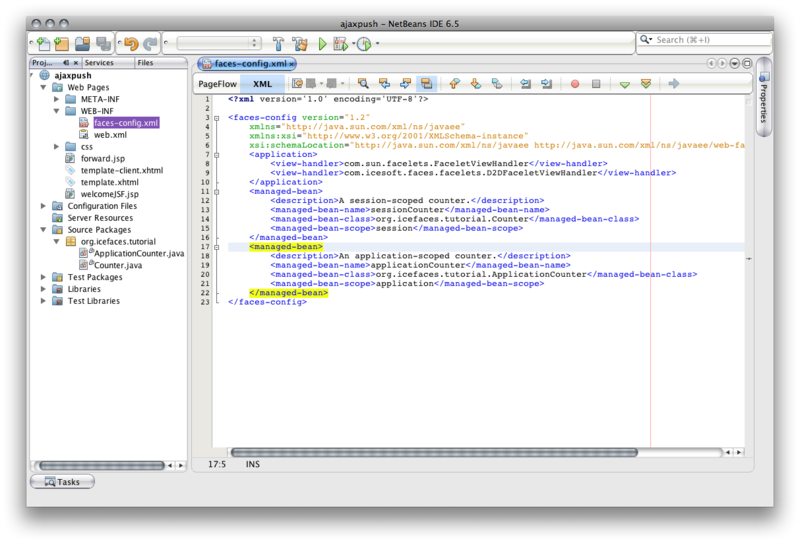 We've installed the ICEfaces Project Integration plugin for NetBeans 6.5 which is available from the site listed above. 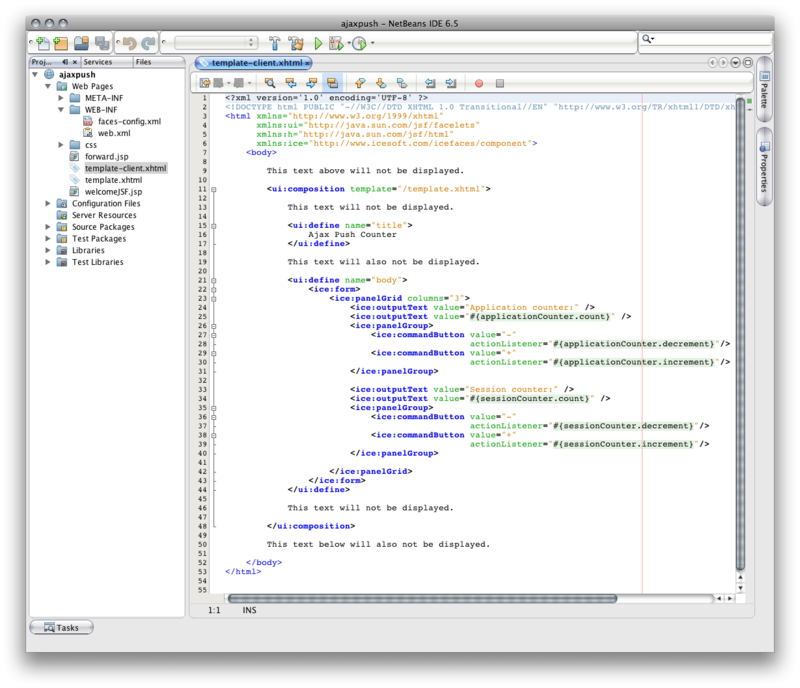 We'll also be developing using Facelets so we recommend that you use the NetBeans Plugins manager to download and install the Facelets Support plugin. The code in this tutorial is designed to run compatibly on JDK 1.4. so we have purposely avoided the use of annotations, concurrency utilities, etc. 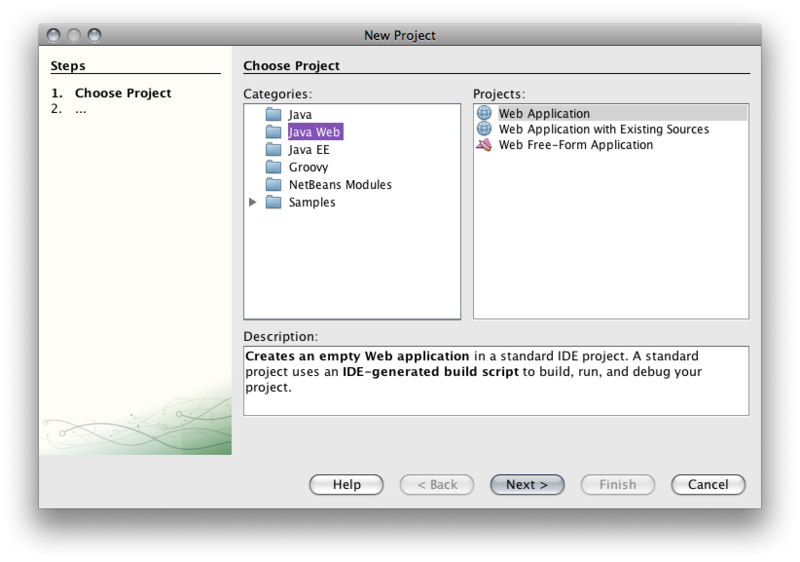 On the first screen of the New Project wizard, choose the Java Web category and the Web Application project. Provide a name (e.g. 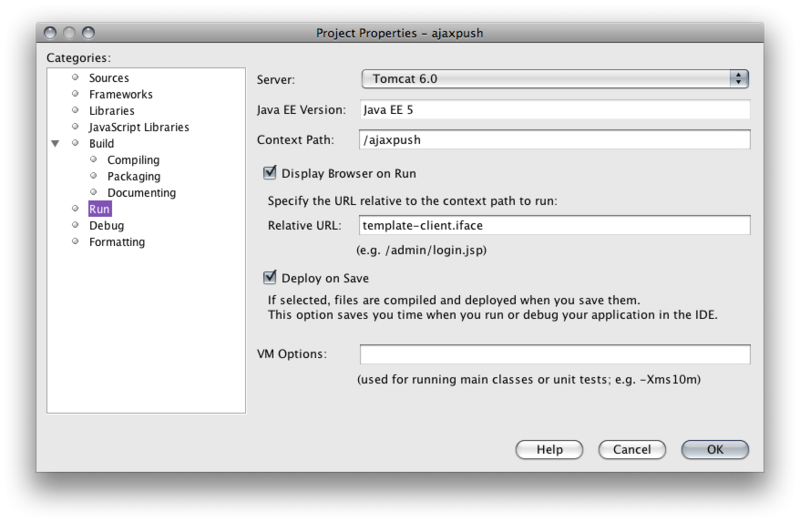 ajaxpush) and location for your new NetBeans project. 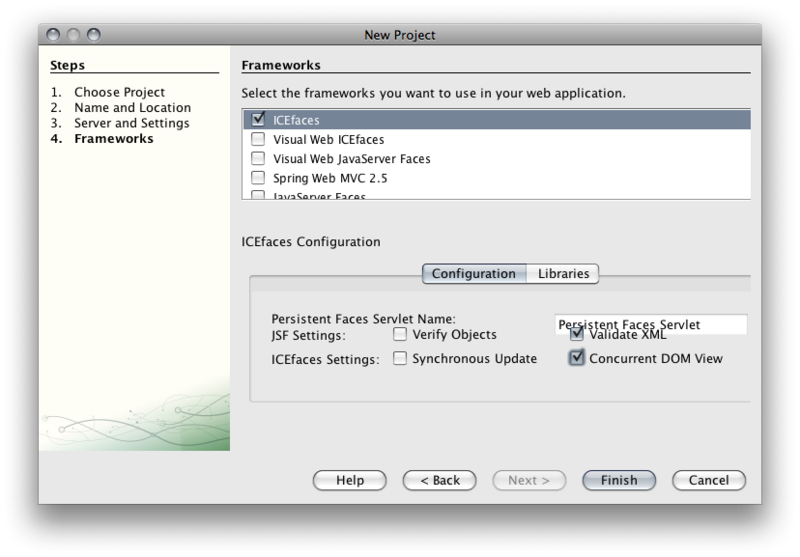 From the list of frameworks provided, choose ICEfaces. Select the ICEfaces configuration option "Concurrent DOM View". If you'd like to design your project visually, you can choose Visual Web ICEfaces instead. As we don't really have a complex visual requirement and we are focusing on Ajax Push, the ICEfaces framework is suitable for this tutorial. If you've downloaded and installed the Facelets Support plugin, you should select the checkbox for that framework as well. 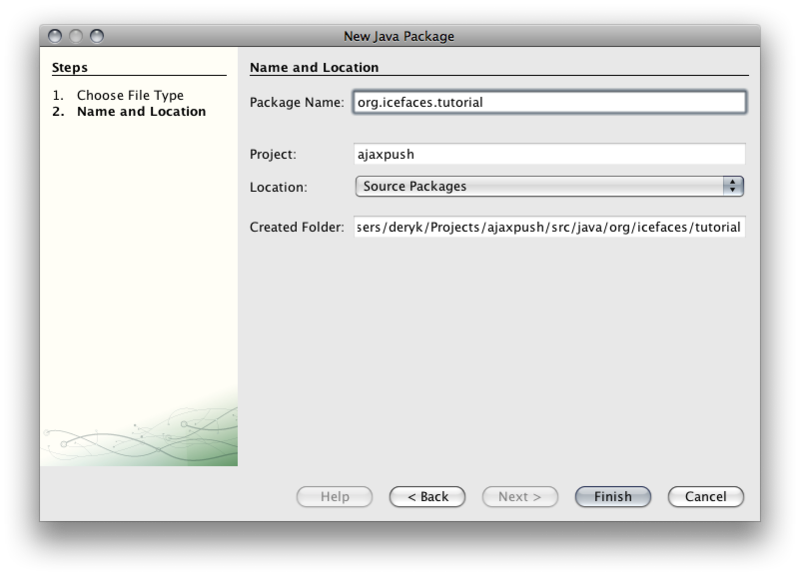 In the Name and Location dialog, type in a new package name (e.g. org.icefaces.tutorial). Type in a new class name (e.g. Counter). Now we are going to provide the logic of our Counter bean. We'll use a simple integer member variable as the current counter value, provide getter and setter methods for the value, and also add a couple of methods for incrementing and decrementing the value. 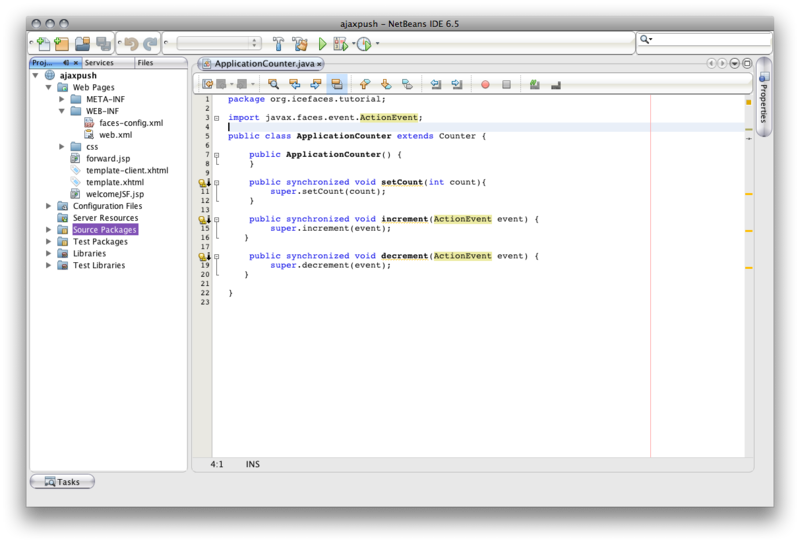 The methods will be used as JSF actionListeners so they need to take an ActionEvent as a parameter. Type in a new class name (e.g. ApplicationCounter). Under WEB-INF, open the faces-config.xml file for editing. 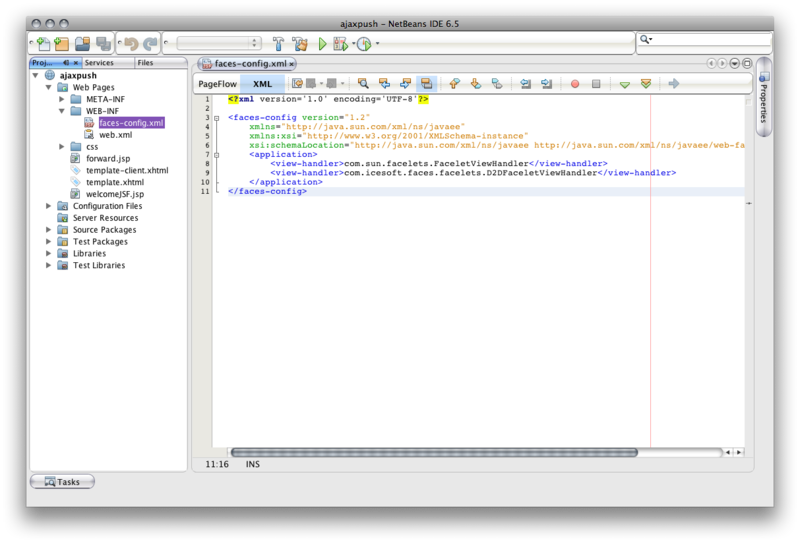 Switch to the XML view (rather than PageFlow). 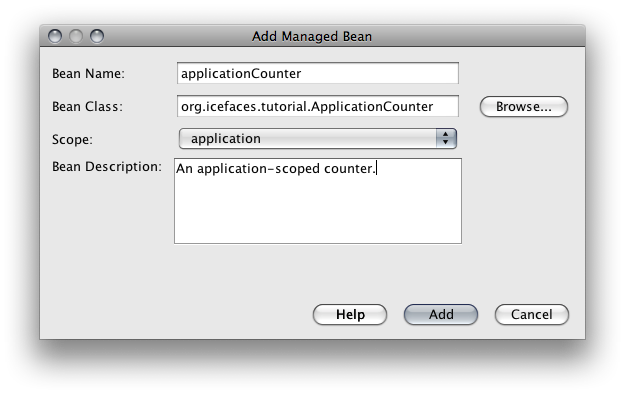 Right-click in the editor and choose JavaServer Faces -> Add Managed Bean..
Give the bean a unique name (e.g. sessionCounter). Type or browse for the correct class (e.g. org.icefaces.tutorial.Counter). Choose the correct scope. For this bean, 'session'. Add a description (this is optional). Give the bean a unique name (e.g. applicationCounter). Type or browse for the correct class (e.g. org.icefaces.tutorial.ApplicationCounter). Choose the correct scope. For this bean, 'application'. Now we need to create our user interface that we can bind our bean values and methods to. When the project was automatically created, the ICEfaces pluging created a couple of JSP files for us (forward.jsp and welcomeJSF.jsp). By adding the Facelets Support plugin, it created a couple of starting facelets pages (template.xhtml and template-client.xhtml). For this tutorial, we're going to use Facelets so we'll be concentrating on the .xhtml resources. With Facelets, the typical approach is to create a template (template.xhtml) that can be used to dynamically include content. Since this isn't designed to be a tutorial on Facelets, we'll simply describe the minium steps required to get our counters up and running. Right-click on your project and choose Properties. Choose Libraries from the Categories list. Click the Add Library... button. Choose "Facelets ICEfaces Run-Time 1.7.2" from the list. When you are done, the faces-config.xml file should look something like this. 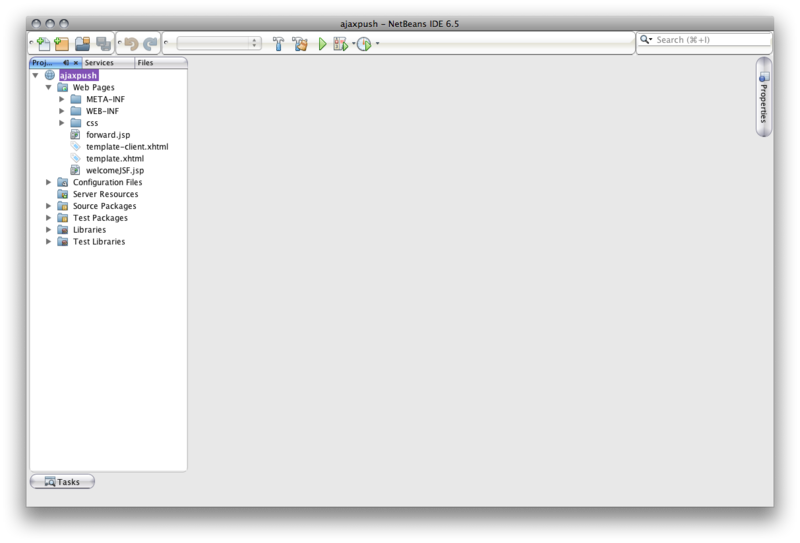 Note that it's possible for more than one ViewHandler to be configured. They are designed to delegate responsibilities appropriately. 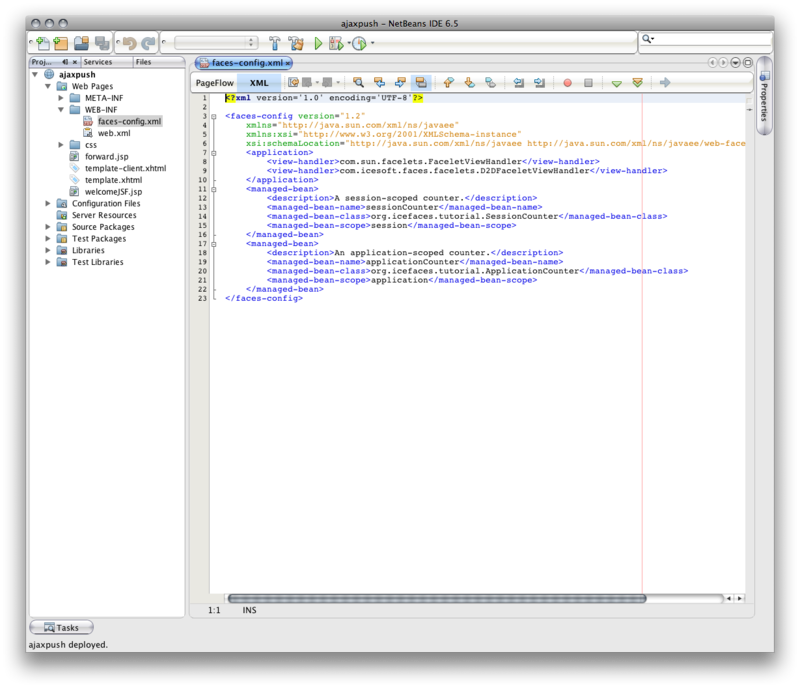 Open up the template-client.xhtml file for editing. This file provides the viewable content based on the configuration described in the template (template.xhtml). 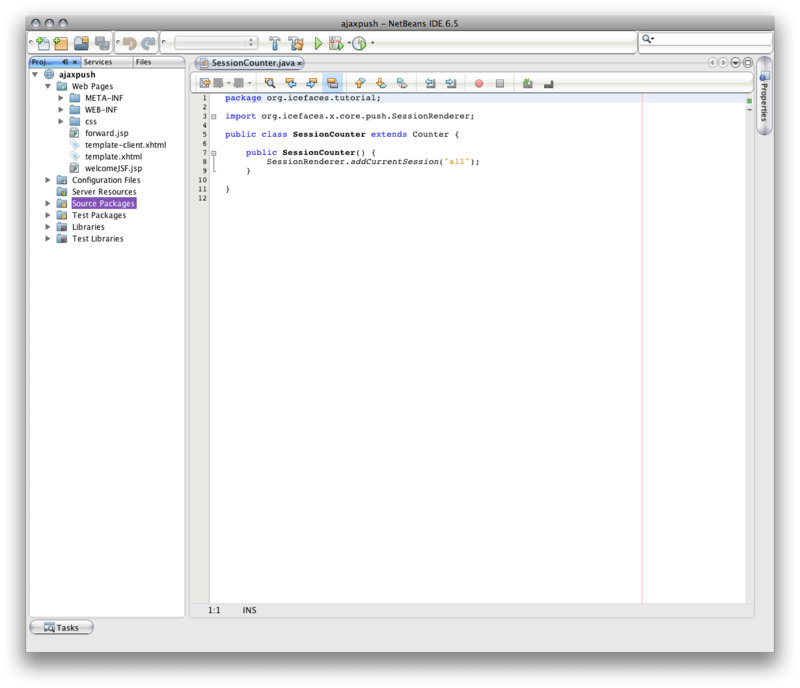 Add the namespace for the ICEfaces components to the html tag. We need to add this so that we can use ICEfaces components (e.g. ) in the page. Hello from the Facelets client template! The body content now provides a number of JSF components including a form, a panelGrid (for layout), outputText for showing the values of our counters, and commandButtons for modifying the values of the counters. The values and methods use the JSF expression language to bind to the backing beans we described in our faces-config.xml. 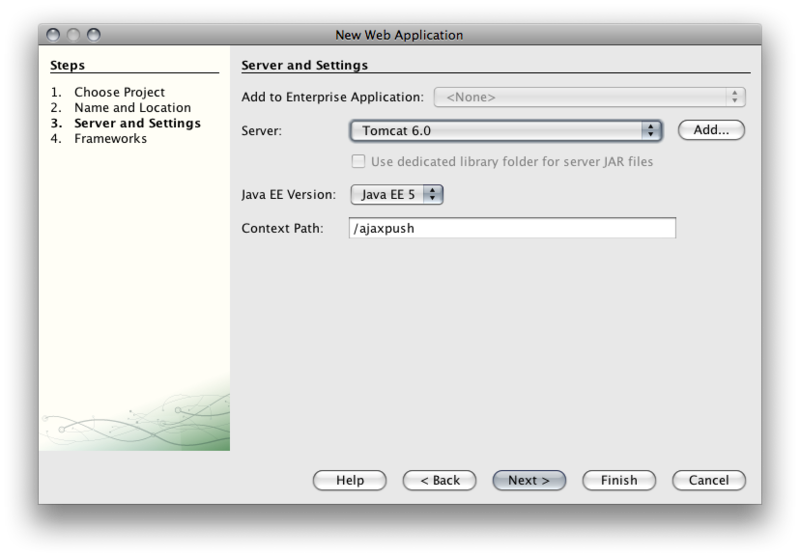 Before running the application, you should ensure that the default URL that NetBeans attempts to use for launching your browser is correct. 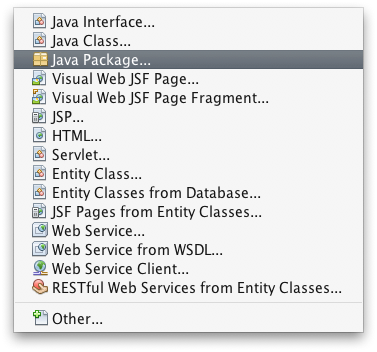 By default, the ICEfaces project attempts to use the JSP page via the ICEfaces extension (welcomeJSF.iface). You should change this to use the default facelets page with the proper extension (template-client.iface). Right-click on the project name (e.g. ajaxpush) and choose Properties. Ensure that the Relative URL value points to your Facelets page and uses the virtual ICEfaces extension (e.g. template-client.iface). You can't just open another window or tab of the same browser instance to do this because browser windows or tabs from the same browser will share sessions. So use two separate browsers (e.g. IE and Firefox) or use browsers on separate machines. Since we haven't added Ajax Push features yet, the application-scoped counter doesn't update automatically. It only updates when you interact with the page. In the following section, we'll use the SessionRenderer API to add Ajax Push so that page updates are automatic. There are basically two parts to using the SessionRenderer API. The SessionRenderer API supports this in a simple and straight-forward manner. Since we want everyone to be able to access the application-scoped counter, we're going to keep it simple and just add everyone to a single, global group. The easiest way to do this is to have the group membership logic in the constructor of the session-scoped bean. That way, when our session-scoped bean is created, it's added to a group. Since we only want to do this for our session-scoped counter, and not our application-scoped counter, we'll create another subclass of Counter that does this for us. Type in a new class name (e.g. SessionCounter). For ICEfaces 1.7.1 and 1.7.2, the SessionRenderer API was considered experimental so the package for it reflects this (org.icefaces.x.core.push.SessionRenderer). For ICEfaces 1.8, the API is no longer considered experimental and resides with the rest of the Ajax Push APIs under com.icesoft.faces.async.render. Now that we have a new bean implementation for our session-scoped counter, we need to update the JSF descriptor to make use of it. Our final step in adding Ajax Push features to our application counter requires modifications to the ApplicationCounter class. What we want is for updates to be pushed out whenever there is a change. To do this, you simply need to call the render method of the SessionRenderer when a notable change occurs. So whenever a change is made to the application-scoped counter, we issue a request for a render to the group "all" which, in our case, means every active session. Clicking the buttons for the application-scoped counter should provide a richer experience. Updates from interaction in one browser that result in a change to the application counter are now pushed out to other active users. And there you have it. Using the SessionRenderer API is an easy and straightforward way to add collaborative features to your ICEfaces applications. Copyright 2006 ICEsoft Technologies Inc. All rights reserved.